Friedman, A.M. & Heafner, T.L. (2007). “…You think for me, so I don’t have to.” The Effect of a Technology-Enhanced, Inquiry Learning Environment on Student Learning in 11th grade United States History. Contemporary Issues in Technology and Teacher Education, 7 (3), 199-216. Waynesville, NC USA: Society for Information Technology & Teacher Education. Retrieved April 24, 2019 from https://www.learntechlib.org/primary/p/24456/. Cohen, D.J., & Rosenzweig, R. (2006). Digital history: A guide to gathering, preserving, and presenting the past on the Web. Philadelphia: University of Pennsylvania Press. Friedman, A.M., & Heafner, T. (2006, November). Website construction in ninth grade social studies. In K. Swan (Chair), Technology Research in the K-12 History Classroom. Symposium conducted at the annual meeting of the College and University Faculty Assembly, Washington, DC. Hicks, D., & Ewing, E.T. (2003). Bringing the world into the classroom with online global newspapers. Social Education, 67(3), 134-139. Lee, J.K., & Clarke, W.G. (2003). High school social studies students’ uses of online historical documents related to the Cuban Missile Crisis. The Journal of Interactive Online Learning, 2(1), 1-15. Levstik, L.S., & Barton, K.C. (2001). Doing history: Investigating with children in elementary and middle schools. Mahwah, NJ: Lawrence Erlbaum Associates. Marshall, C. & Rossman, G.B. (1999). Designing qualitative research (3rd ed.). Thousand Oaks, CA: SAGE Publications, Inc.
Martorella, P.H. (1997). Technology and the social studies– or: Which way to the sleeping giant. Theory and Research in Social Education, 25(4), 511-514. McGlinn, M. (2007). Using the "Documenting the American South" Digital Library in the social studies: A case study of the experiences of teachers in the field. 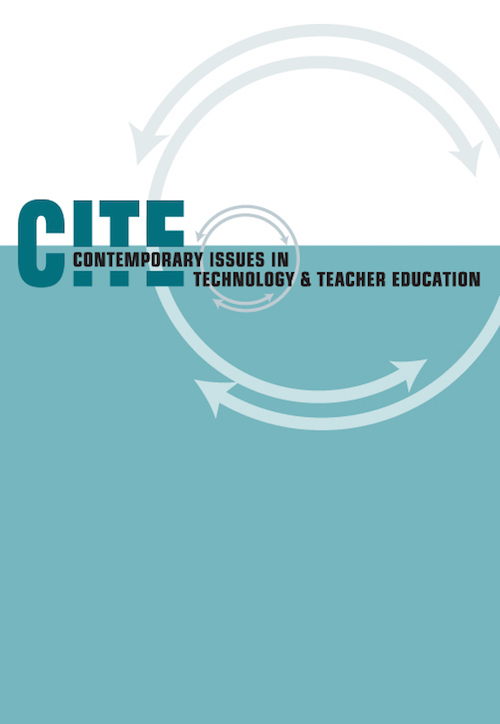 Contemporary Issues in Technology and Teacher Education [Online serial], 7(1). Retrieved July 2, 2007, from http://www.citejournal.org/vol7/iss1/socialstudies/article1.cfm. Milman, N.B., & Heinecke, W.F. (2000). Innovative integration of technology in an undergraduate history course. Theory and Research in Social Education, 28(4), 546-565. Milson, A.J. (2002). The Internet and inquiry learning: Integrating medium and method in a sixth grade social studies classroom. Theory and Research in Social Education, 30(3), 330-353. Saye, J.W., & Brush, T. (1999). Student engagement with social issues in a multimedia supported learning environment. Theory and Research in Social Education, 27(4), 472504. Saye, J.W., & Brush, T. (2006). Comparing teachers’ strategies for supporting student inquiry in a problem-based multimedia-enhanced history unit. Theory and Research in Social Education, 34(2), 183-212. Thornton, S.J. (1991). Teacher as curricular-instructional gatekeeper in social studies. In J.P. Shaver (Ed. ), Handbook of research on social studies teaching and learning (pp. 237-248). New York: Maxwell Macmillan International. VanFossen P.J., & Shiveley, J.M. (2000). Using the Internet to create primary source teaching packets. The Social Studies, 91(6), 244-252.